The Indiana State University Alumni Association has recognized Rachel Leslie of Terre Haute and Thomas J. "TJ" Mattick of Avon with Graduate of the Last Decade (GOLD) Awards for 2013. GOLD Awards recognize graduates who are outstanding in their professions; have made significant contributions to their communities, states or nation; and have exhibited interest in the university and/or the ISU Alumni Association since leaving the campus. The Alumni Association presented the awards Saturday during its annual Founders Day program at the Richard G. Landini Center for Performing and Fine Arts. A 2005 Indiana State graduate with a bachelor's degree in communication, Leslie held a variety of positions with the Terre Haute Chamber of Commerce for six years. She joined the staff of Saint Mary-of-the-Woods College in March 2012 and is the college's associate vice president for advancement. While at the Chamber of Commerce, Leslie held the positions of director of marketing, director of membership development, senior vice president, executive vice president and interim president. In less than a year at St. Mary-of-the-Woods, she has created a corporate giving program, helped launch an $11 million campaign to build a sports and recreation center and increased overall giving to the college by 42 percent. She also handles public policy issues for the college president's office, is a member of the Terre Haute Downtown Rotary Club, serves on the board of the Vigo County Education Foundation, is a founding member of Terre Haute Young Leaders and serves on several United Way of the Wabash Valley committees. "Many at SMWC would agree that Rachel is a rising star at our institution, and very deserving of this honor," said Karen Dyer, the college's vice president for advancement. "On campus and off, Rachel is well respected and considered a valuable community leader for the whole of Terre Haute." Leslie's accomplishments with the Chamber of Commerce included leading a 2010 recruiting campaign that attracted a state record 218 members in three days. The American Chamber of Commerce Executives named her one of the "Top 40 under 40" chamber executives in the nation. She also served as the Terre Haute representative in coordinating the 2011 "Evening of Celebration" in which the Indiana Society of Chicago recognized the collaborative successes of the community and Indiana State University while at the same time preparing for the birth of her first child and dealing with the departure of the local chamber's president. Leslie is "the ultimate team player and a great ambassador for our community," Terre Haute Mayor Duke Bennett wrote in support of her nomination for the award. "Rachel personifies all of the qualities the GOLD award is meant to recognize," added Teresa DuBoisExline, chief of staff in the office of Indiana State University President Dan Bradley. Leslie credited her education at Indiana State and the university's "ambitious faculty" for giving her "the courage to reach for goals I may have not set for myself otherwise." She said she was pleased to accept the award "in honor of my mentors who have been a part of both my personal and professional journey thus far.As I continue to build my leadership voice, I know the tools provided to me in my undergraduate experience at ISU will provide some of the confidence I need to continue setting goals higher and out-of-the-box." Mattick, a vice president with BMO Harris Bank of Central Indiana, holds two degrees from the Scott College of Business at Indiana State. He completed a bachelor's degree in management and finance in 2001 and a Master of Business Administration in 2005. He also obtained a liberal arts degree in economics in 2001 and completed a study abroad program during his junior year. He spent a semester at Lulea Tekniska University in Lulea, Sweden. Mattick joined BMO Harris Bank in 2009 following eight years with Fifth Third Bank. A member of the Scott College's inaugural Young Professionals Board, he mentors students in the college's Networks Professional Development Program, is active in United Way of Central Indiana, serves as an elder at Our Sheperd Lutheran Church and is a volunteer basketball coach. Mattick's professional achievements include being the No. 1 performer in BMO Harris' Business Banking Group in 2011 and being the only Harris Employee to qualify for the Millionaire's Club, which recognizes those producing at least $1 million in annual revenue, which he has done twice in three years with the company. "He is a highly motivated person and has achieved a great deal in the short time that he has been away from Indiana State, not only in his professional life but in other endeavors as well," Troy Kafka, BMO Harris Bank vice president and regional business sales manager, said in nominating Mattick for a GOLD Award. "TJ worked hard to plug himself into the community and help those in and around the central Indiana area expand their businesses," Kafka said. "He is outstanding in everything he does personally with his wife and two young daughters and professionally with his work ethic and giving back to his community through volunteer efforts." Brien Smith, dean of the Scott College of Business, called Mattick "enthusiastic, dedicated and personable ... He is committed to Indiana State and to the college and our missions to engage all of our alumni and to provide our students with the best possible learning experiences - in and out of the classroom." 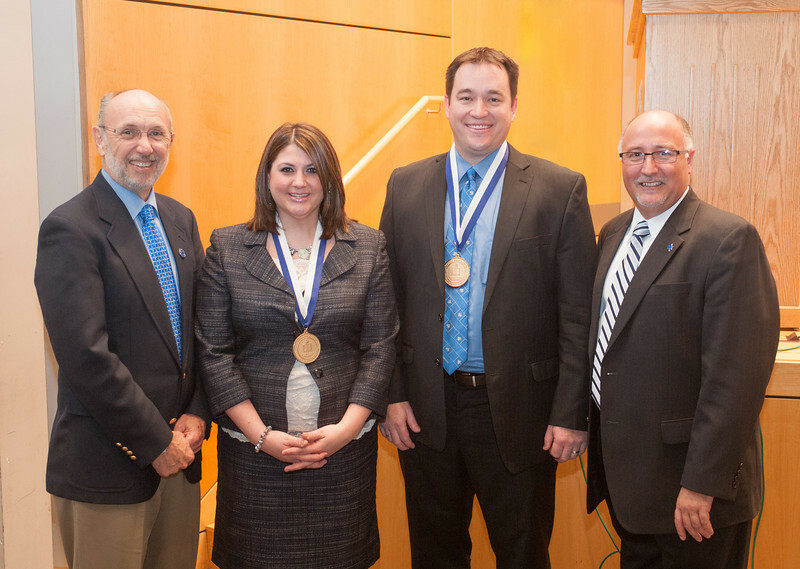 Calling Indiana State the "perfect college" for him, Mattick said he is honored and humbled to receive the GOLD Award. "My time at Indiana State University prepared me well for the ever-changing business climate that I work in today," he said. "Being recognized by the university post-graduation is a wonderful honor. I will continue to work diligently to represent ISU well in future endeavors. I will be forever grateful for the opportunity to have studied at ISU and look forward to continuing to work with the university in the future."